Sparky, you are thinking along my lines. There is a lot that can be done as it stands, but I'm not satisfied with it as it stands so I will be applying for a manufacturing license. I would be more than happy to let you all know how I get on with this and where it ends up. I suspect as other members have said I will get shafted at the planning application stage, but I won't be giving up. I might look up Dean fireworks. Do look up Dean fireworks, there is a great deal of information on what he had to go through to get his licence. It is very doable, you will need deep pockets though. Thanks Digger, I see this as a long term plan / view with some scrimping, saving and begging along the way. Were I to be successful I would ideally like to open it up for the good of the community to come and make use of it. This member is doing the right thing - a licensed manufacturing set up is the only way to proceed in my opinion, and it's not beyond the reach of most people with the land to base their activities on. 1. Plan your site / planned activities and ambitions. 2. Set up a company to hold the licence. 4. Prepare a safeguarding plan - not needed yet but do it all the same as this will illustrate clearly where you stand in the location and who might be affected. 5. Establish the position in regards to planning - refer to the safugaurding plan and make it available to the planners - they will need it eventually anyway. If the draft has been produced properly - that comes with experience or can cost a lot - the process can be minimised at the Inspectorate end. Our last application cost £360 from memory in inspectors time. By the time the license is granted you will receive a certificate - I kept mine for years then lost it, you get so long to pay up the final fee for time then the license is issued, usually with a caveat that nothing can happen until the first inspection. This gives you three years to get the fabric of the place up and running - at least the bits you want up and running to allow you to operate legally. Our last big variation created a number of ambitious additional magazines, our latest removes them - they existed on paper and are being removed without ever existing! The challenge is that some planning authorities regard "explosives factory" as an instant rejection even if you do have enough space. HSE will not discuss a factory application unless you have a site with confirmed planning permission. I was speaking to my ELO yesterday regarding my renewal of my AO licence for flash. This time I had also requested "UN MAN2". In my covering letter I had directed him to this forum for further reading about UN MAN2 if he needed it. He admitted that he had no previous experience with UN MAN2 but found the information here very informative and now understood the reason behind including it and would issue the licence straight away (he actually completed it while on the phone to me). 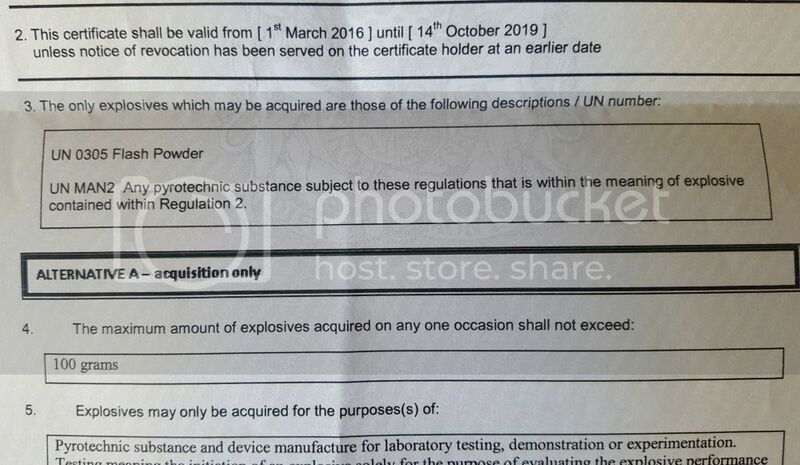 What was of some frustration to him (and slightly worrying considering that this is now about 18 months old) is that the computer system still "says no" when he tried to input Flash Powder UN 0305 on the AO licence. He / we assume that the system still has not been updated to include flash as needing a certificate! In the end he created the certificate manually (which he had to do last time) but this means that it I don't get reminders etc when it is up for renewal because it is not created using the "official" template. Out of interest, what region are you in? We are trying to piece together which regions/ELOs are receptive and which aren't to see where the certification problems lie. Nice one Rip Rap !!!! As I have said before, my ELO is brilliant. He is genuinely interested and very cooperative. That's excellent Rip Rap, I wish mine new what he was doing. I have been completely ignored. Just realised Rip Rap said his ELO completed his certificate while he was on the phone. My ELO said it wasn't his decision if I got a certificate he just collected the information and there was no one to issue it anyway!